My book club continues to meet semi-regularly, which I think is pretty awesome. If you don't remember the background, when I still lived in New York, I started a book club with three of my friends. We then promised to meet regularly online, but didn't start up again until about a year after our first in-person meeting. Now we're still not great about meeting every month, because we all have totally different work schedules, but we do meet every six to eight weeks using Google Hangouts. Our latest book was The Remains of the Day by Kazuo Ishiguro. In short, it was technically very good, but sorta kinda bad. I know my degree isn't in literature, but I was reading this with friends who do have English degrees. And the consensus was the same. All the technical elements of writing were great. Like the use of flashbacks to help us understand the present-day relationship between the protagonist and the woman he is visiting. Like how the tone of the narrator, especially as he tells more and more stories from his past, reveal so much of his character and his self-suppression of emotions. Like the historical setting and how the reader has the general knowledge of the time period, so as the narrator reveals more about the past, we understand so much beyond his recollection what was going on. And maybe because of how technically good Ishiguro writes the voice of Stevens (the protagonist, a butler), it creates a distance between the story and the reader. Like I wanted to keep reading to see if my hypotheses about Stevens' boss and his lady friend were true... But not so much that I could manage to read more than 20 or so pages in a sitting. I wasn't on the edge of my seat. I was tempted basically the entire time to look up on wikipedia instead of finish the book itself. 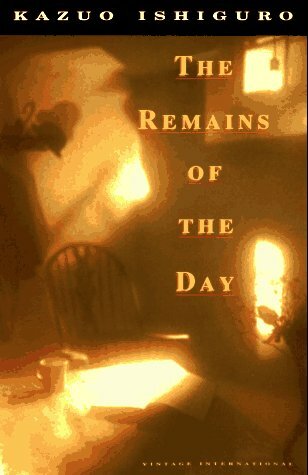 So if you want a book that leaves you lackluster, but also wanting more, but also feeling dissatisfied and confused... then read The Remains of the Day. If you want to read a book that is still brilliant in regards to the technical aspect, BUT also interesting and engaging and full of what-the-fuckery (in a good way), read his novel Never Let Me Go. I am linking up with Heather for Book Club Friday. I will add actual pictures, links, and the Book Club Friday thingy when I'm not on my iPad.